Love With Food Gluten-Free snack box delivers monthly snack subscription boxes filled with all natural or organic gluten-free snacks. 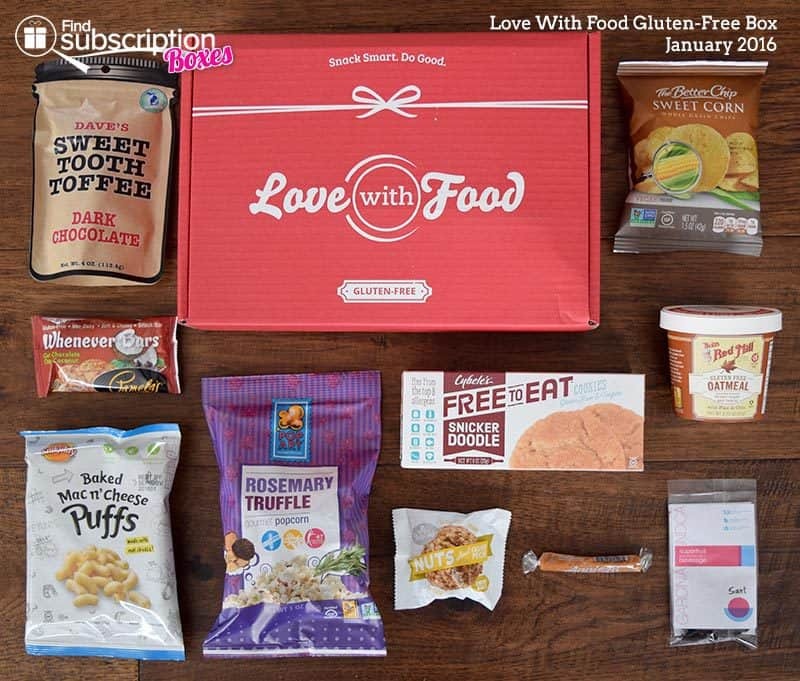 With today’s Love With Food Gluten-Free box review, we’re unboxing the Love With Food January 2016 Gluten-Free Box. 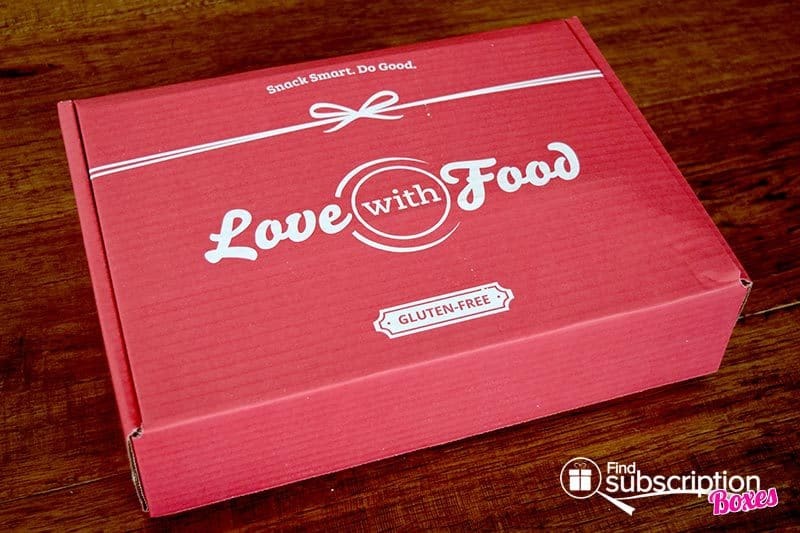 The Love With Food Gluten-Free snack box is curated by KC, the G-Free Foodie. 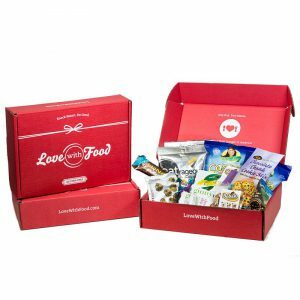 The January 2016 Love With Food snack box theme was Love is Kind. Love With Food includes a colorful product flyer that describes that month’s gluten-free snacks. The flyer also notes whether the snack is vegan, non-GMO, and/or dairy-free. Here’s a first look inside our January Love With Food Gluten-Free Box. 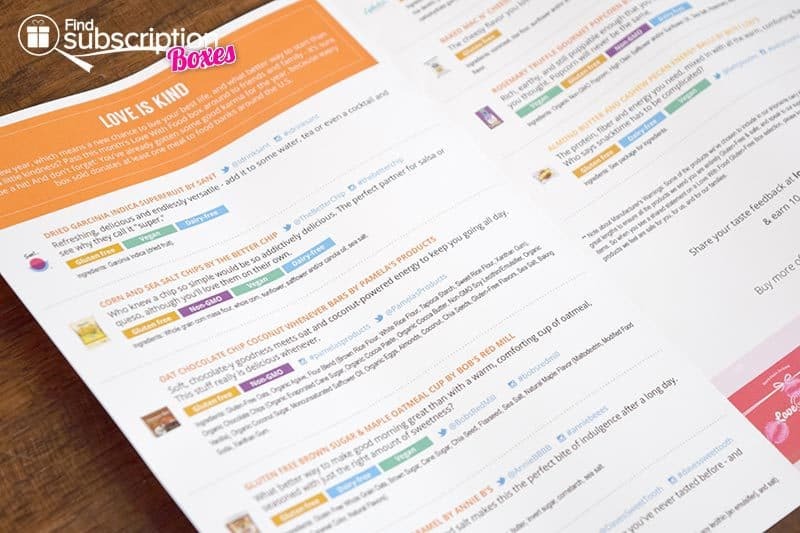 There were 10 gluten-free snacks in the January 2016 Love With Food Gluten-Free snack box. When butter isn’t enough, this richly flavored truffle and rosemary popcorn may be your new favorite. Snack on these cheesy puffs without any of the guilt. There’s just 100 calories per cheesy snack bag. Free of the top 8 allergens, these Snickerdoodle cookies will remind you of the ones grandma used to make. These better-for-you chips are great for pairing with salsa, guac, or by themselves. You’ve never taste a toffee like this – rich, chocolatey, with just the right amount of toffee crunch. Add this superfruit to water, tea or a cocktail for a refreshing and delicious taste. Start your mornings with a warm cup of oatmeal that has the subtle sweetness of brown sugar and maple. Get everything you need to help power your day – protein, fiber, and energy – with the comforting flavors of almond butter and nuts. Power your days with this delicious blend of chocolate, oats, and coconut. Indulge in this sweet and salty caramel as a sweet afternoon treat. 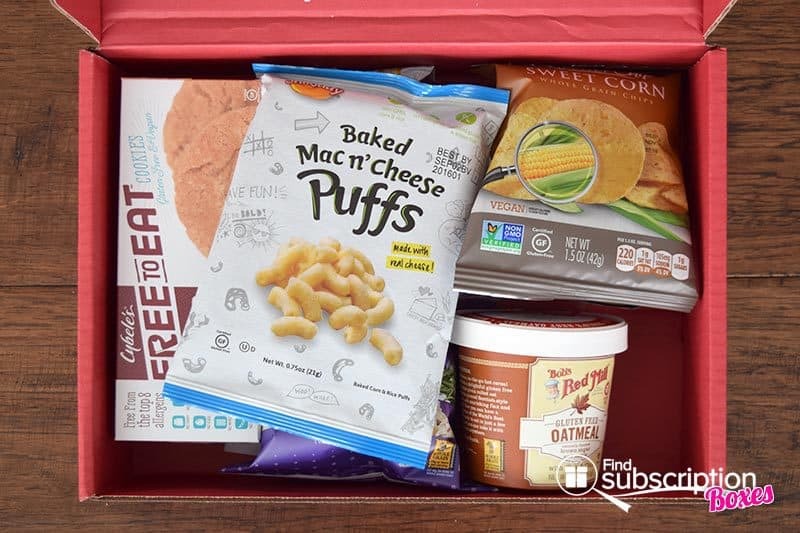 From the gourmet popcorn to the sea salt caramel, the Love With Food Gluten-Free snack box introduced us to new, and delicious, gluten-free snacks and brands. The Dark Chocolate Toffee has a softer texture, with a subtle crunch from the almond bits, which was a nice twist on more traditional hard toffee. The nutty energy balls and coconut bar were great for afternoon power boosts. Which was your favorite January Love With Food Gluten-Free snack? Check out our February Love With Food snack box spoilers for a sneak peek into next month’s box! 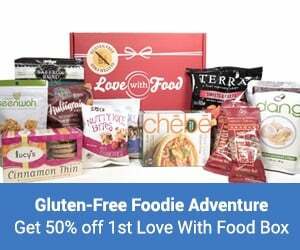 Use our exclusive Love With Food promo offer to save 50% off the Love With Food Gluten-Free Box. How would you rate Love With Food Gluten Free ?